Remember when Lauren confessed to loving all things RED this season? Well, as you can see, she wasn't lying and I may actually need to stage an intervention if it gets out of control. But I'm totally on board with this look, where she paired a new blazer with a striped top and a studded, structured bag. It's totally nautical, with a little bit of hard rock thrown in. I think it works. I've been looking for a striped shirt forever! Love this look! You look really beautiful and that bag is really cute! perfect combo! love the blazer! Digging this take on nautical for fall – great heels! Love the outfit! Great bag! Red and stripes = winning combo! Classic ensemble - looks PERFECT on you! i am actually a new fan of "red". i used to hate it on myself and now i can't seem to get enough either! you look fab l...and i love seeing nyc through your lens m! Great sailor-look, which I love BTW, I mean, stripes, blue, red and white, whats not to love!? I love your complete ensemble..Classy and equally chic!! You look really beautiful, I adore the red blazer. as always beautiful pictures!! and I'm loving your red blazer!! Hi, I'm a new visitor to your blog! I really really like your blog! I'm pretty impressed by your style! I got excited to know that you are from NYC. I was just there last week and I have to compliment that New Yorkers have awesome style, including you! I went crazy shopping there because the shopping is fantastic! I'm now a follower. Btw, I'm trying to promote my blog. Check it out when you get the chance! Thank you. Great style here, of course I'm following you back! Thanks for the comment and for following me :) I am following you back! Your blog is pretty, love this post. Followed back of course...you have a wonderful blog girls!! Keep up the good work!!! Really awesome look! 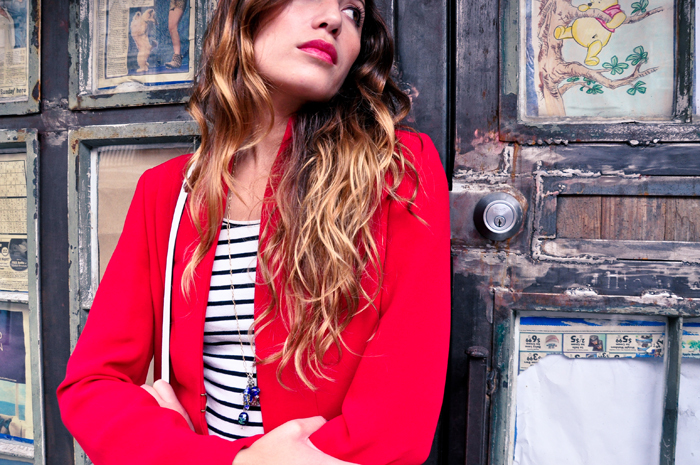 I love the red blazer, beautiful over the stripes! Thanks for the comment love :) I followed you back! Love your ombre hair by the way -- I just got rid of mine and I miss it!! Super stylish look-love the blazer and the pop of color! LOVE that blazer! And your blog. This is so good! Following you back on GFC and Bloglovin, thanks for the comment and for following me! Awesome outfit, I love the bright red color! Hi lovely!!! :)Thanks for your comment and follow me!! now, I follow you too!! I hope you have a nice day!! The red looks perfect with stripes and I love that the look isn't preppy despite a blazer and stripes! Amazing fall look!